Were the Krakow Post to announce that an army of robots has been sighted in Krakow – and specifically, at the square adjacent to the train station and Galeria Krakowska – it might cause some panic. However, the sighting of one robot makes it an object of curiosity. At first, it looks like something out of WALL-E – upon approach, you half expect it to squeak “Eee-va!”. But upon closer inspection, the little wheeled machine, adorned with the familiar orange JUSTUS logo, just sits there for the most part, and you wonder what exactly it is thinking – or if it can. But it turns out that it does have a brain – however, its brain is of the conventional human variety, sitting a few hundred metres away at the controls. 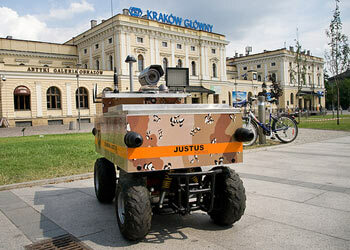 The wheeled robot, formally called the Mobilny System Monitoringu Wizyjnego (Mobile Visual Monitoring System, or MSMW), is described as a “patrol robot”, and is one part of the JUSTUS security firm’s services. But don’t think it’s a one-machine destroyer a la Terminator. The MSMW is simply a “supplement” to a security team, performing the same functions as a human guard on patrol duties. It is controlled remotely by an on-site human operator. Unlike a human patrol, however, the MSMW can patrol 24 hours a day, seven days a week, and is not affected by heat, cold, rain or other adverse weather conditions. The robot is equipped with a video camera and microphone, as well as a speaker and large antenna. The signal from its “eye” and “ear” is transmitted to both an on-site monitoring station, as well as to JUSTUS headquarters. The on-site operator then has the power to intervene if the robot’s cameras witness any suspicious activity. For the most part, the robot is used to get a closer look in a situation where it might be dangerous for a human to do the same. If the operator then notices an attempted forced entry occurring, he or she will notify the police, who can use the robot’s video feed to analyse the situation before they arrive. The robot is not equipped with weapons of any sort, so intervening in the case of serious crimes is left in the hands of its human associates. However, with its speaker linked to the operator’s microphone, it can intervene in cases of public intoxication, potential fighting, trespassing, or other minor crimes. Since its video feed is archived, it can be later used for catching those who operate prohibited vehicles on the square, or in cases of vandalism. But those who would think that this unarmed robot is an easy target will be in for a surprise, as it is equipped with an anti-theft system and can perform basic defence functions. And while its video feed is constantly monitored, the robot also has automatic controls, during which it automatically performs a patrol along a pre-determined route. So far, the little machine has made such a stir simply because it is the first one in Krakow – and all of Poland, for that matter – to patrol a public space. However, robots have been used by JUSTUS throughout Poland since late 2007, though up to this point they have only guarded private property. While this is not the first time a robot has been used as a security guard, perhaps previous instances have been slightly more glamorous than guarding a shopping centre. The U.S. Air Force employs robots for security duties, guarding bases within the country. However, those robots are well-armed and cost between $200,000 and $500,000 a pop. At the moment, JUSTUS is the only Polish security firm using robots, but its spokesman indicated that the competition is working furiously to release their own robotic security models. So is the MSMW the future? Hardly – JUSTUS is already working on another model to take over the more traditional job of a security guard. However, its plans are highly secretive at this point, so we will have to see whether the future of security will resemble Star Wars or WALL-E – or something completely different.